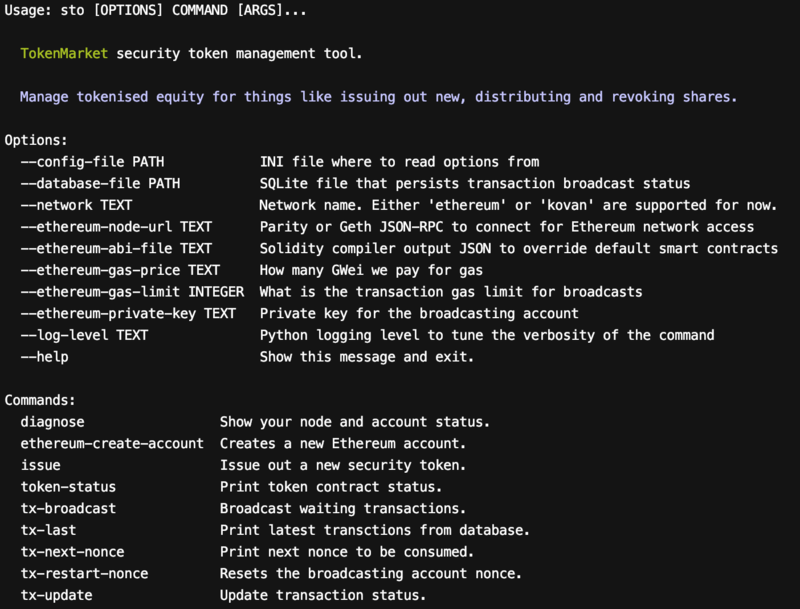 Security token interaction happens through a command line sto command that connects to an Ethereum network node and a local database. sto command is automatically installed via Docker. This tool is for command line users and developers only. We do not provide an end user application as open source. For business services please contact TokenMarket business representatives. The sto command line application is provided as a Docker image to minimize the issues with painful native dependency set up for your operating system. To use sto we will set up a command line alias, as Docker command itself is quite long. Docker will automatically pull an image from Docker registry for your local computer on the first run. We map port 8545 to the localhost as that is normal Ethereum JSON-RPC API. After installing see how to set up the software. Windows PowerShell instructions coming soon. Meanwhile use Linux instructions and Linux Subsystem for Windows.